The Tiwa Savage-Tee Billz current show of public shame has become one of the biggest talks in the Nigerian entertainment industry. The duo have joined the list of celebrity bigshots who have had or are having breakup issues in their marriages. We cannot easily forget the breakup between 9ice and Toni Payne or the Brad Pitt-Jennifer Aniston-Angelina Jolie love triangle which are still big talks till this day. Blake Shelton, American country singer and television personality broke up his marriage with Miranda Lambert and ran after his current girlfriend, Gwen Stefani. These are just to mention a few. 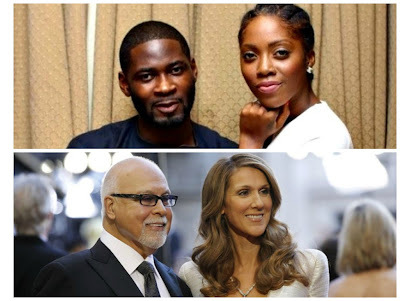 In the case of Tiwa Savage and her former manager, there was the need for them to have learned from the world’s most popular singer, Celine Dion, since she too got married to her manager and producer. Dion’s marriage to Rene Angelil lasted till the latter’s death, a marriage of over 25 years. Unlike Tiwa and Tee Billz, Dion and Angelil were the greatest love story ever. In my own little thoughts, celebrities are meant to be role models, they’ve got fans who look forward to being like them in all ramifications. But the line they toe becomes bumpy, fans become disappointed. Dion’s marriage to her manager is a typical example of how things should have been for Tiwa and her man if only Billz had applied maturity. No matter what may have happened in his own family, a man holds the key to breaking up or not breaking. I always hold this belief that it is the way a man treats his wife that would determine her feedback. No matter the nagging traits or how deceitful she may be, I believe it is easier to change a woman than a woman changing a man. It is on records that when a woman takes care of the bills where the man always fails, there is the tendency that one day she will come for your head if she sees any reason to. It is a lesson to every man. It is ideal for guys to try as much as possible to make ends meet and know that the family (wife and children) is his primary responsibility even if the woman earns more than you do. Truthfully, there is more to marriage than just loving the person you are involved with. Some time ago I wrote an article titled “Why should youmarry for love”. It painted a picture of people who love for no reason. It is the qualities you see in a man or woman that trigger the love you have for the person. Yes I said it, love is triggered by reasons of the qualities seen and not the instant attraction. Values are constant, they don’t change. Love is not lust or about personal selfish interests! This is one of the reasons for many breakups in marriages nowadays. The mistake many make is marrying someone out of pity. Oh because he or she helped you become a celebrity, to show you appreciate the gesture, so you must marry them? There ought to be many questions before delving into a journey that may soon be reversed if care is not taken. This love we talk about should not be one sided. The moment a woman loves a man that does not love her in return (lovelorn), there is bound to be hiccup along the line. The moment a man loves a woman who does not love him as well, then it’s even worse than the other way round. From observations, it’s glaring that men do not easily love but when they do, they love to a fault… they can be easily broken. When they become broken, it is harder for a man to move on unlike the female counterpart (although there are individual differences). In the real sense of this, take the oscillating pendulum as an example. If the weight on it is not balanced, one of its wings will slide down while the other one goes up. Once there is no balance in marriage, people go on divorcing not minding the outcome or the effects on their children. In marriage, you can quarrel, but the maturity applied in resolving the issues (especially from the men) is what matters most. Again, this is where Tee Billz failed woefully. The details of the dispute dished out to the public were really uncalled for. They were just minor issues that could have been talked over. You know women and their mouth! This is what makes a man. Needless to say that in marriage, once there is no communication, there is no relationship; if there is no respect both ways, there can’t be love; once there is no tolerance, there will be continuous breaking of heads; and once there is not trust, reasons not to continue your marriage begin to surface. The key takeaway in the breakup issues is that celebrities and non-celebrities alike should know that a wise one learns from people’s mistakes but the foolish will not learn from his or her own mistakes. We pray for eternal union in all.